Crustaceans possess a huge variety of body plans and inhabit most regions of Earth, specializing in the aquatic realm. Their diversity of form and living space has resulted in equally diverse eye designs. This chapter reviews the latest state of knowledge in crustacean vision concentrating on three areas: spectral sensitivities, ontogenetic development of spectral sensitivity, and the temporal properties of photoreceptors from different environments. 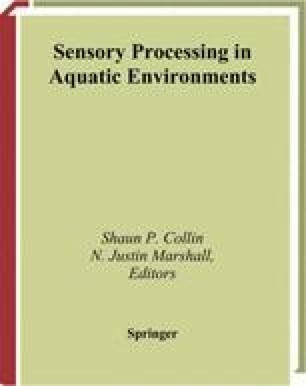 Visual ecology is a binding element of the chapter and within this framework the astonishing variety of stomatopod (mantis shrimp) spectral sensitivities and the environmental pressures molding them are examined in some detail. The quantity and spectral content of light changes dramatically with depth and water type and, as might be expected, many adaptations in crustacean photoreceptor design are related to this governing environmental factor. Spectral and temporal tuning may be more influenced by bioluminescence in the deep ocean, and the spectral quality of light at dawn and dusk is probably a critical feature in the visual worlds of many shallow-water crustaceans. Plasticity in photoreceptor tuning is a recently emerging theme both in crustaceans and other animals. The seasonal variation in crayfish spectral sensitivity and spectral sensitivity change in single stomatopod species from different depths provide two examples of this. Other oddities such as the need to see the heat from hydrothermal vents, color dances in water-fleas, and the possible influences of temperature on the spectral tuning of visual pigments are also discussed.